UK – Impact Production Services (IPS) has added nearly 200 aPix2 high resolution indoor LED video panels to its inventory, supplied by A.C. Entertainment Technologies Ltd (AC-ET). 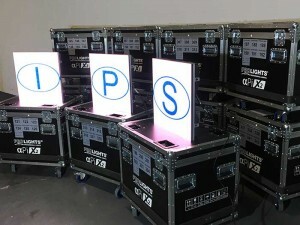 IPS, which offers equipment dry hire through to complete technical production services for events, approached AC-ET’s specialist video sales division when it was looking to make a significant investment in a high resolution LED screen system to service the latest needs of its rental clients. AC-ET recommended the aPix2 panel due to its 2.9mm pixel pitch, which is perfect for today’s applications demanding ever higher display resolutions – such as corporate / AV presentations or other types of content benefiting from a smoother look. The video sales division supplied IPS with 198x0.5 square metre aPix2 LED panels, plus related screen processors and flybars, creating a total display area of nearly 50 square metres featuring 5,588,352 pixels. In addition, AC-ET’s in-house Tourflex cabling assembly service supplied 220 metres of Tourmate powerCON cables for use with the panels. The supply also included full onsite product training, backed by a two year warranty and AC-ET’s ‘peace of mind’ technical support for the aPix2 system. The full order was turned around in seven days. IPS is holding aPix2 demo days on the 14th, 15th and 16th February at its premises in Milton Keynes, which will give visitors considering potential rental applications for the system a chance to see its full capabilities in action. Developed by ProLights, the AlphaPix series offers amazing value without compromising on performance, quality or reliability, for professionals looking to maximise the return on their investment. The impressive feature set includes black-faced SMD LEDs for high contrast and superb colour consistency, colour calibrated panels for superior image reproduction, a high refresh rate for flicker-free results on camera, advanced grayscale properties, automatic image correction, and a 160° viewing angle. Utilising a robust, lightweight, die-cast aluminium housing with a fast interlock system requiring no tools, the front access, magnetically positioned LED Display Modules create a seamless image which can be configured in almost any shape to suit the creative requirements of productions. In addition, the design provides easy and fast maintenance as well as reducing setup times – making it ideal for AV rental companies, specifiers, installers and integrators.